Naval Air Station Pensacola hosts the annual Blue Angels Homecoming Air Show and Veterans Day Weekend. The 2017 Naval Air Station (NAS) Pensacola Blue Angels Homecoming Air Show will be held on Nov. 10 and 11, when the U.S. Navy Aerobatic Team close out the season during the Veterans Day weekend. 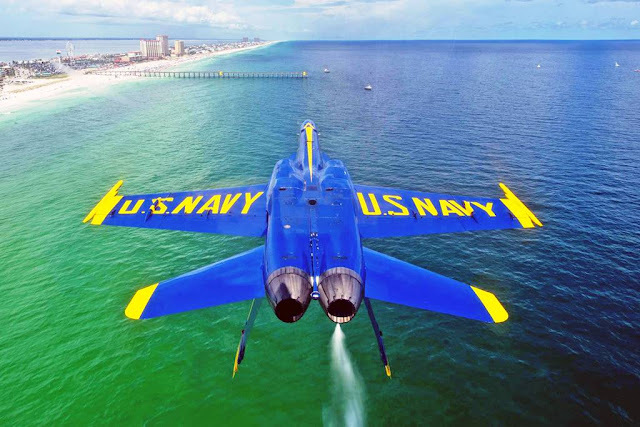 Established in 1914, NAS Pensacola was the first air station commissioned by the U.S. Navy for the training of aviators in the infancy of Naval Aviation. The 2017 Blue Angels Homecoming Air Show will feature a variety of performers showcasing the best in both military and civilian aviation, highlighted of course by the final 2017 performances by home-based Blue Angels. The Day Show starts the event on Friday morning to continue with a Night Show that includes nighttime aircrafts, performers and the largest fireworks display in the Pensacola area. On Saturday, enjoy the daytime air show filled with high-flying performers. This year features the return of the U.S. Navy Leap Frogs parachute team, Shockwave Jet Truck, and the best military and civilian aircraft performances in the country.